The following was received in newsletter form from Salt Lake City. We wanted to share it with everyone interested in receiving more information about this proposal. It also highlights opportunities to gather input from the public. A public hearing will be held Thursday, June 22. Stop by between 6-7:30 pm at Architectural Nexus, 2505 Parleys Way. You can also leave us a comment that will be submitted to the Transportation Dept. A slurry seal will be performed on an eastern section of 2100 South this summer. Thank you for your interest and participation in the 21st & 21st Small Area Plan. The draft plan is awaiting action by the City Council. Salt Lake City is considering some changes in the 21st & 21st area, and is reaching out to get your input. This will be briefly presented at the Sugar House Community Council tonight (Wed., June 7). There will be a project-specific open house on Thurs., June 22, as detailed below. 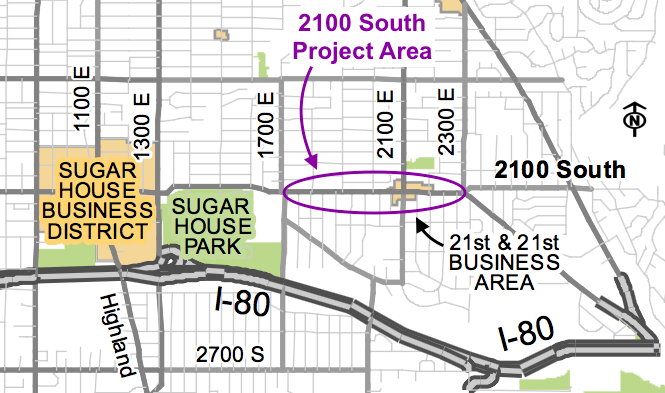 Salt Lake City will be performing scheduled pavement maintenance on 2100 South this summer. With this resurfacing comes an opportunity to consider changes to the striping. To reduce traffic crashes by about 25-30%, Salt Lake City is considering a change to one lane in each direction with a continuous center turn lane, and optional bike lanes. 2100 South (1700 E to 2300 E) will be slurry sealed in mid-July, weather permitting. 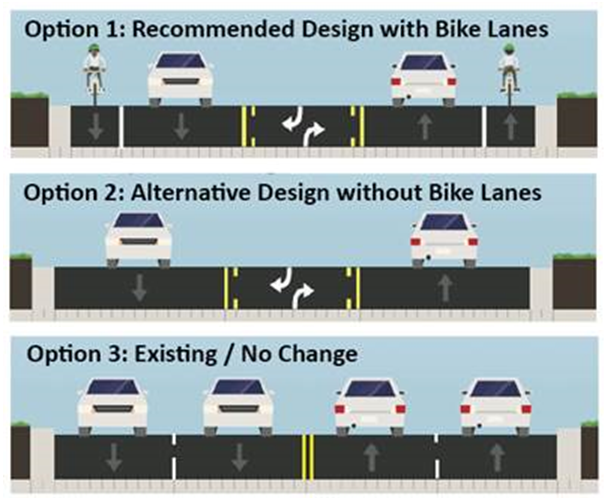 Salt Lake City wants community input to determine if the section should be re-striped for safety concerns or the lane configuration left as is. Regardless of final design, construction impacts will be minor. The street will remain open to traffic on the 3-4 days of resurfacing and striping. Business access will be maintained, and residential abutters will be given additional advance notice about driveway access. Nationally, this type of redesign results in about 29% fewer crashes. Locally, several redesign projects have shown similar success. 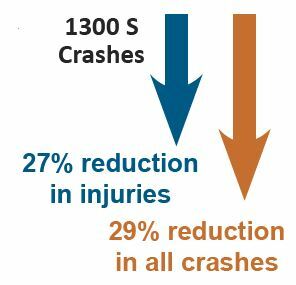 For example, 1300 South (State St to 700 E) saw a 29% reduction in crashes. A residential section of California Avenue showed similar results. Based on analysis of crash types, about 30% of the crashes on 2100 South might be avoided with a three-lane design (Option 1 or 2). Several similar street redesigns in Salt Lake City have handled the same volume of traffic or have seen a slight increase. There may be slightly longer travel times, primarily at rush hour. Find out more and give us your input. Arch Nexus, 2505 Parleys Way. If you have questions, thoughts, concerns or simply want to weigh in, please respond by July 4, 2017. * This is an accessible facility. People with disabilities can request reasonable accommodations with 48 hours advance notice. Accommodations may include alternative formats, interpreters, and other auxiliary aids. Please contact Christine Passey, Coordinator for Disability Rights, Christine.passey@slcgov.com, 801-535-7110, TTD 711.